Our commitment to our members is to provide the best experience and during the two-week Summer Recess we will be working on over 300 projects ranging from repairs, preventative maintenance, facility investments and enhancements. 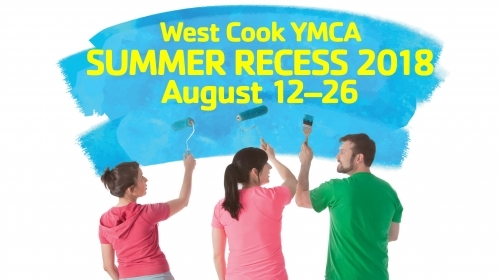 This year the West Cook YMCA will invest over $250,000 to improve your Y. Members are asked to clear out lockers and remove locks by Friday, August 10th. Locks that are left after Saturday, August 11th will be removed. In addition, personal items that are not removed by August 10th will be stored for 30 days. After October 1st all items will be donated to local charity. During Summer Recess the following facilities and programs will be operating. Summer Camp at St. John’s, The Maywood Pool at Fred Hampton Aquatic Center and Chronic Disease Programs at remote locations. During Summer Recess we are planning to offer alternative locations for some of our programs and access to pools. Those locations will be posted below as they come available. *Must bring Y ID and state ID. Will be asked to sign waiver and limited to 12 visits per person. If under 18 years, must be accompanied by a parent/guardian the first time. Under 11 years, must be accompanied at all times.